Scanpan is a pretty big name in the cookware world. While the name doesn’t command the same sort of respect that names like All-Clad carry, it’s still a well-liked manufacturer that makes high-quality pots and pans. The CTX line is a fairly recent addition to the Scanpan lineup. Like most Scanpan products, these pots and pans are handmade in Denmark. The CTX line utilizes a 5-ply construction, meaning it has a stainless steel exterior, three layers of aluminum, and then an additional layer of stainless steel just under the non-stick cooking surface. Unlike most Scanpan products, the outer layer of the CTX line is made from magnetic stainless steel. This means that every pot and pan is immediately ready for use on an induction cooktop. This set is well-made, stylish, and very effective in the kitchen. It’s absolutely a solid choice. If you want a newer, larger cookware set, this Scanpan CTX collection is a great choice. If you just want to pick up a single non-stick pan to fry some eggs in, this is a top choice. If you’d like to give Scanpan a try, consider getting this versatile pan. One of the biggest concerns with non-stick pots and pans is the inclusion (or absence) of certain toxic chemicals. Scanpan uses a modern non-stick coating that’s totally free of PFOA. It’s a blend of both PTFE and ceramic titanium that’s engineered for heat and scratch tolerance. This means that Scanpan products are oven safe to 500 F. Many non-stick pans are only oven safe to 350 F, In other words, the non-stick that Scanpan uses is especially resistant to heat. Scanpan has some marketing material that talks about how competing non-stick interiors only last for two years. While this message is technically correct, it’s highly misleading. Scanpan’s nonstick does NOT last for dramatically longer than other similar non-stick coatings. 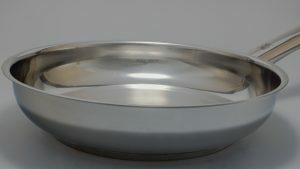 In fact, the most common complaint about Scanpan products is that the non-stick coating goes away after a couple years of use. This is pretty much a guarantee when you pick up any non-stick pan, regardless of the type of non-stick used or who makes it. 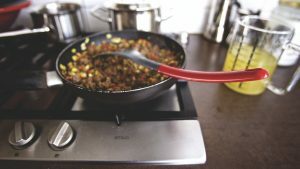 You should purchase your Scanpan products with the expectation that they’ll last between one and five years, depending on how much you use them and how they’re cared for. Some CTX products use a new nonstick coating called Stratanium. The primary benefit of this coating is an increase in durability and longevity over previous nonsticks. Unfortunately, the pots and pans that use this non-stick are simply too new for us to evaluate this claim. A 50% increase in non-stick lifetime would mean consumer pans would last about 8 years with proper care and handling. This may very well be how long the new Stratanium pots and pans last, but we’ll need to wait 8 years to know for sure. As I mentioned before, the CTX line is made with both aluminum and stainless steel. This is the perfect marriage of metals for cookware. Aluminum is light, strong, and conducts heat very well, while steel is stiff, durable, and non-reactive. It makes an easy to clean exterior and an excellent cooking surface (although it’s covered in PTFE here). The combination of these materials make the CTX line durable and give it excellent heat distribution. Food will heat up very evenly and the pots and pans will quickly change temperature in response to the burner controls. The cookware isn’t exactly light, but it’s also not particularly heavy. If it takes a lot of work to move a pot from a burner to the counter, it’s probably because you’ve got a lot of food inside the pot. Scanpan uses 100% recycled aluminum wherever they can. Their plant is also well below the strict Danish government’s limits as far as pollution and toxic materials go. If you want to support a cookware manufacturer that goes above and beyond to try to protect the environment, Scanpan might be a good choice. Scanpan products are pretty expensive. The CTX line is no exception. There are a couple obvious reasons for this: the products are handmade in Denmark. Both parts of this statement are expensive. 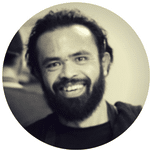 First, Scanpan has to employ actual craftsmen to produce their pans, which increases their overhead. Second, the workers have to be paid competitively in a country with a relatively high cost of living. Third, the cookware has to be shipped halfway around the world so it can arrive in your kitchen. Scanpan’s cookware is also pretty well designed. 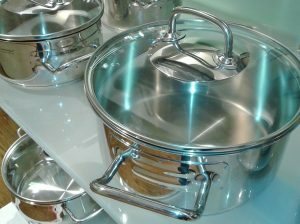 It uses good materials and features solid design choices that make each pot and pan pleasant to use in the kitchen. These things cost money: both for the initial design, then for user testing, and finally for the quality materials that make their way into the finished product. The bottom line here is that it makes a LOT of sense to me that Scanpan is expensive. They sell high-quality products that are handmade in an expensive country. This means that their products are going to cost more. Whether or not that additional cost is worth paying is up to you. Here are some detailed reviews of various CTX products to help you get a feel for how the line handles in the kitchen. This 10-piece cookware set utilizes the same 5-layer steel and aluminum construction as the rest of the CTX line. It’s got a modern PFOA-free non-stick interior, metal lids with glass inserts and steam vents, This Scanpan oven safe set can withstand temperatures of up to 500 F.
While Scanpan says that this set is metal-utensil and dishwasher safe, you should probably still keep your cookware set away from both of these things. The non-stick may very well be 10 times harder than steel, but it’s definitely not 10 times as scratch resistant. You’ll get a lot more life out of your non-stick if you hand wash these pans with a gentle detergent and stick to using wooden and silicone utensils. The stay-cool stainless handles on the pans in this set do a pretty good job of staying cool. The handles on the larger stock pots leave something to be desired for longer cooking jobs, but that isn’t exactly unusual. If you’re like me and you cook a lot of dishes where you leave a big pot simmering for several hours, you might want to have a potholder or two handy. The non-stick coating performs excellently. It’s just as good (if not better) as any top competitor as far as non-stickiness is concerned. It’ll go toe to toe with Teflon, Thermolon, and other coatings. I don’t have the years of experience with these pots and pans that I’d need to give you an honest answer regarding the coating’s durability, but it seems like it should be pretty on-par with the rest of the market there as well. The only real downside to this set is the cost. It’s a fair bit more expensive than your basic aluminum non-stick set. While it’s more durable (due to the stainless exteriors), the non-stick still has an effective expiration date. Overall, this set is well-made, stylish, and very effective in the kitchen. It’s absolutely a solid choice. There are two primary differences between this Scanpan cookware set and the set above. First, it’s got a newer Stratanium non-stick coating. This is supposed to be more durable and last a bit longer. Second, it’s got more pieces. You get an extra saute pan, an extra saucepan, and a lid for each. As I said above, it’s difficult to properly evaluate claims regarding non-stick durability, especially for newer products. We can’t tell if a coating will last for 8 years until the coating has been around for 8 years. I do, however, have a general trust that Scanpan has done its homework and is trying to make the best products that they can. This new non-stick is certainly not going to be worse than the last one, which has a pretty good track record. Otherwise, the materials and design of this set match the set above very well. Each piece is strong, transfers heat very well, and works on all types of ranges. The lids have both glass inserts and steam vents to make cooking pretty darn easy. The set is oven safe to 500 F, dishwasher safe, and supposedly safe to use with metal utensils. Again, I’d be somewhat wary of testing the last two claims. If you want a newer, larger cookware set, this Scanpan CTX collection is a great choice. The extra pans give you a bit more freedom in the kitchen (or a bit longer before you have to do dishes) and the newer coating means that you’ll have a cutting-edge cookware set in your very own kitchen. If you just want to pick up a single non-stick pan to fry some eggs in, this 8″ CTX is a top choice. It’s got all of the trademark features of the CTX line, including excellent heat distribution, PFOA-free non-stick, and a sturdy stainless-steel exterior. As far as the non-stick itself goes, this is an excellent egg pan. You can slide around foods with literally zero oil or fat without a problem. You might want to avoid doing so, however, as some ceramic non-sticks can be quickly damaged if you use no oil at all. Scanpan uses a complicated hybrid that combines both PTFE and ceramic materials to give you the best of both worlds. Put a small amount of butter, oil, or cooking fat down to try to get a little more life out of your pan. Unfortunately, this CTX frying pan is plagued by the same longevity issues as every other non-stick pan. It has an effective working life of one to five years. Again, this is very, very normal for non-stick pans. You’ll be hard-pressed to find one without the same downside. 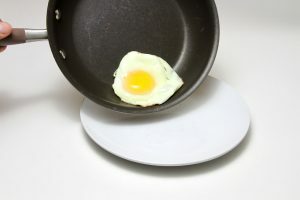 While it’s a bit on the pricey side, this may very well be the best pan you can find when it comes to frying eggs. It’s made in an environmentally-conscious plant with recycled materials, has excellent heat distribution, and is fantastically non-stick. It’s definitely worth considering. When you want to add a single piece of cookware to your collection, I tend to recommend something like this covered saute pan. It’s deep enough for liquids and features straight sides, but it’s also wide enough for stir-frying or cooking eggs or pancakes. The lid helps boil liquids and retain heat when that’s necessary. 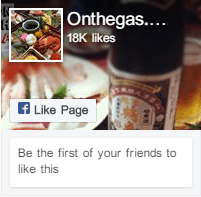 This pan shares the same general attributes as the other CTX products on this page. It’s made from recycled aluminum and stainless steel, features a PFOA-free hybrid non-stick, and is compatible with induction cooktops. As such, if you’d like to give Scanpan a try, consider getting this pan instead of the frying pan above. You’ll be able to cook a lot more dishes in it and you’ll get to see the quality-of-life features the CTX line offers in action. This includes a well-fitting lid with a glass middle and steam vents, and stay-cool handles that actually stay cool. All-Clad Copper Core Review: The Best Cookware Set, Period? 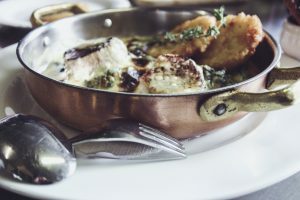 Chantal Cookware Reviews: The Original Ceramic Cookware? Woll Diamond Plus Cookware Reviews: Is Diamond Cookware Better?